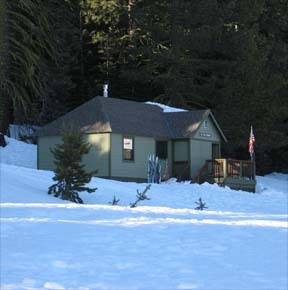 The Van Vleck Bunkhouse, built in 1957, is nestled in a red fir forest on the edge of a meadow. The bunkhouse is all that remains of the Van Vleck Ranch site, which from the 1860's to the 1960's operated as a cattle ranch. 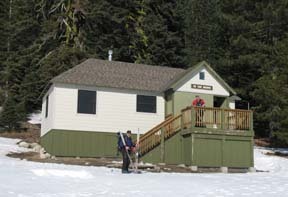 The Bunkhouse, a facility operated by the Forest Service, sleeps eight people and can be reserved through Recreation.gov both winter and summer. Additional information is available from the Forest Service. 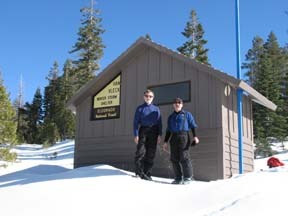 The Bunkhouse is deluxe compared to other ski huts in the Sierra. It is outfitted with a propane oven and cook-top, propane heat and lights, and basic pots, pans and utensils. To top it off, there is running water and a flush toilet inside. The tour to the Bunkhouse is a very rewarding experience for intermediate and advanced skiers alike. The terrain is varied with idyllic sections along tree lined roads, wide open areas and vistas of the Crystal Range. It can also offer navigational challenges if the visibility is poor. The route, partly on snow-covered roads and partly cross-country, is well marked with blue diamonds and ribbons. However, don't let this lull you into a sense of ease! 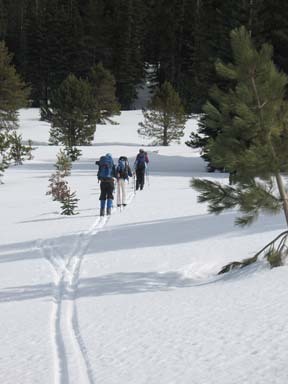 The route requires stamina and speed if you are skiing in and out in one day. Under poor weather conditions the flat area near the landing strip is difficult to navigate, sending more than one experienced skier off in the wrong direction for an unexpected and chilly bivouac. Speed is less important if you stay overnight at the Bunkhouse, but then you must carry a heavier pack. The Van Vleck Storm Shelter is located on route to the Bunkhouse at mile 2.4 and at the junction of the Van Vleck Bunkhouse and Shadow Lake tours (the tour to Shadow Lake has not been created yet — stay tuned). The storm shelter is essentially that — a place to get indoors in bad weather or spend the night in an emergency. For some people the shelter is a destination in itself. Following the marked route in this section makes navigation through the nondescript, tree-covered terrain much easier. If you didn't have the markers you would first travel east toward a small ridge (it looks like a knob from the direction you approach it) and then you would travel around the south side of the ridge and descend to the bridge. 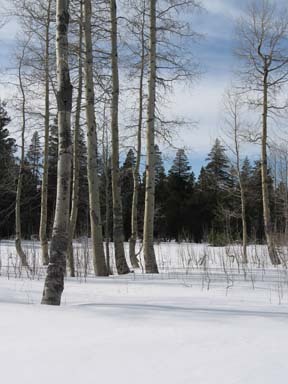 Ski south on the snow-covered road for 0.9 mile, over the highpoint of the route, until you reach a small aspen grove (6). A landing strip is located 100 yards to the southeast over a very small rise. This section contours through corridors of trees and through flat, open areas. In can be difficult to follow the road in the open areas. Descend gently along the road and through a corridor of trees for 0.6 mile until you reach Milkhouse Meadow (7). 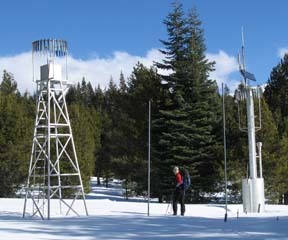 Ski south on the road for a total of 0.4 mile until you reach the weather station (8) located on the east (left) side of the road. 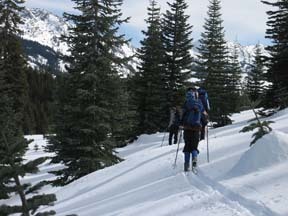 Ski south and then west on the road for a total of 0.3 mile until you reach the northeast end of Timothy Meadow (9). Ski west on the road along the north side of Timothy Meadow and then into the trees for a total of 0.5 mile until you reach the east end of a meadow (10). 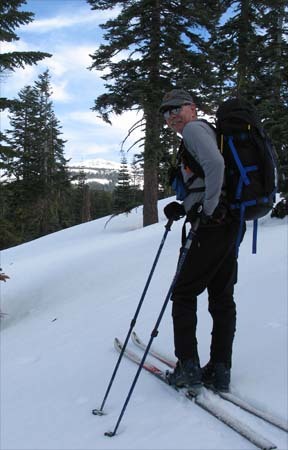 Ski southwest through the meadow for 0.4 mile until you reach the Van Vleck Bunkhouse (11). The route through the meadow does not follow the road that loops around the northern arm of the meadow. Instead it crosses the north arm. Blue mega-diamonds are located on both sides to the arm. Retrace the route for 5.6 miles back to the trailhead (1). Two alternate routes are shown on the map for this tour. Alternate Route 1 connects Milkhouse Meadow with the meadow where Van Vleck Bunkhouse is located. You may want to use this route for one of a couple of reasons. It is an excellent alternative return route from the bunkhouse affording a change from the road skied to the bunkhouse. It can also be combined with the road to the bunkhouse to form an excursion during a layover at the bunkhouse. The route is straight-forward to follow though you will need a map and maybe a compass. From the bunkhouse ski up the northern arm of the meadow in which Van Vleck Bunkhouse is located and then continue to ascend north to a saddle. You may encounter the old road that once passed through here. From the saddle ski around the west side of Peak 6949 and then east along its north side. Finally descend east into Milkhouse Meadow and continue to ski east to the road described in the main route to the bunkhouse. The view of Tells Peak as you round the north side of Peak 6949 is outstanding. Alternate Route 2 is presented as an alternative to the descent from the Van Vleck Storm Shelter to the South Fork of the Rubicon River via the narrow road, which is often icy after trodden by skiers and snowshoers. 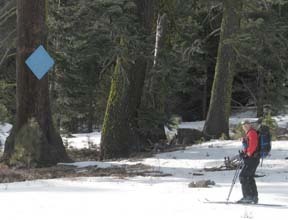 It also offers skiers a wonderful opportunity to carve turns between scattered trees.